The order for my wood is being processed. I buy the wood from a dealer here in BC, and they sand it to my specs. I used to have to sand it myself, which required having a wood shop do it, or a friend. Now I get it done for me, which saves a huge amount of time. They only charged me half an hour labour. I spent a long time sawing the outer edges of the mold today. My tiny band saw is not made to cut through 3″ thick plywood. But it did, painfully slowly. I sanded it all up and put the halves together. They didn’t mate perfectly, of course, so I sanded the mating surfaces. 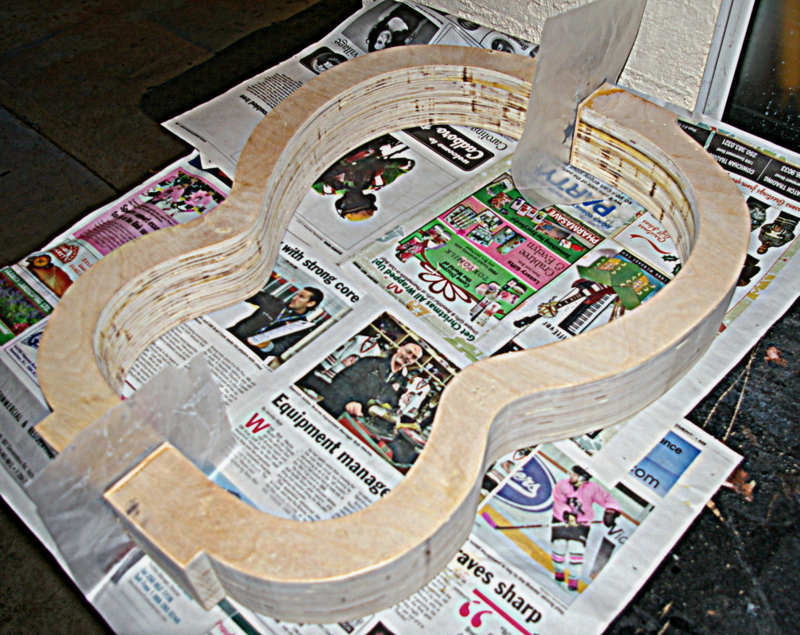 Then they were a bit short so I added a thin piece of spruce to each end to make up the loss. They were still not mating perfectly, so this time I did what I should have done first – I got out the JB Weld. I separated the halves with a little waxed paper, and applied a gob of epoxy to the mating surface ends of one half. Then I gently pushed them together, with the whole thing flat on a table. I bought draw catches to clamp the halves together and I will put dowels in to ensure they register properly.